Wood conference tables have been the main choice of conference room outfitters forever. Don’t get me wrong—a wood table is classic, rich, and warm, and can be stunning with the right design, color, materials, and accent. It’s just that so many are not. Many styles and colors have been in play since Hector was a pup. The wrong wood table can look and feel old and tired. When it comes to companies and how they present themselves, the wrong table can impart a company image that conveys those same feelings. Now you can make a 90-degree turn, and choose a modern conference table with a fresh look, new materials, and unique designs. Personally, I’m inclined to try different things and look at older elements in a different way. It’s the perennial question: how can I give new life to older items in the context of current function? In line with this type of thinking, 90 Degree Office Concepts is continually exploring new table designs we feel will give companies like yours a more modern conference room and a new twist on conventional meetings. 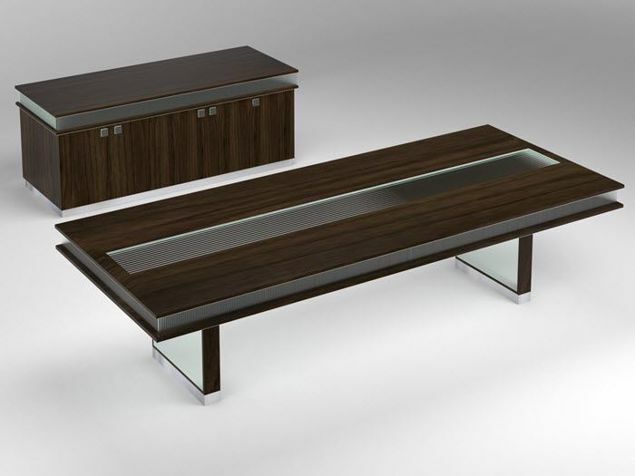 For this reason, we have created the Vienna Modern Conference Table. The impression you’ll give with the Vienna Modern Conference Table reflects today’s mindset. From the ground up, the table offers a refreshingly different visual element. The two opposing leg styles with center band appear to divide the two halves while at the same time joining them. You have the ability to select your own materials and colors to add your own individual personality to your conference room. If wood is your preference, we can add classic elements or embellish your table with metal or stone. Stone slabs are natural, and can be shown on request. Sized to order. 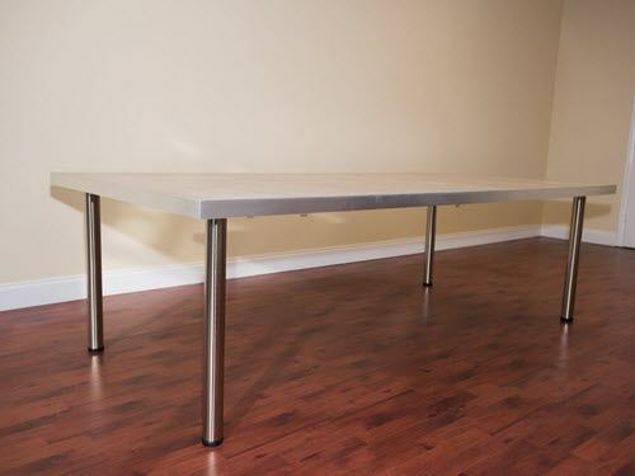 This modern conference table can be ordered as a 48" x 96” table, or enlarged to fit your room size perfectly. Our products shown are intended to demonstrate unique options, and may or may not reflect our entry-level pricing. 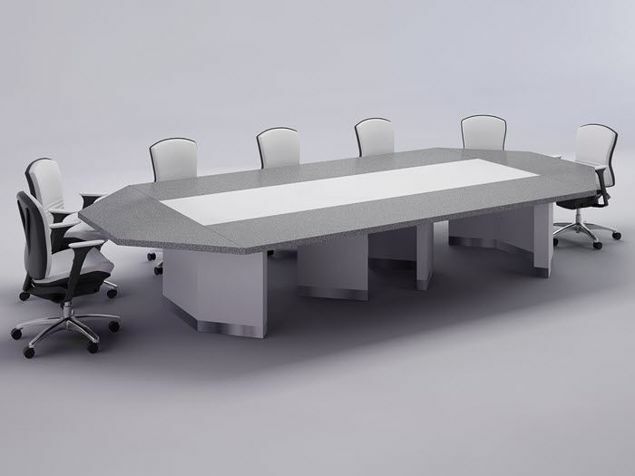 The Vienna Modern Conference Table shown here is 48" x 108" x 31"H, and is designed with a brushed aluminum base and antiqued bronze on the midsection and sub-top. 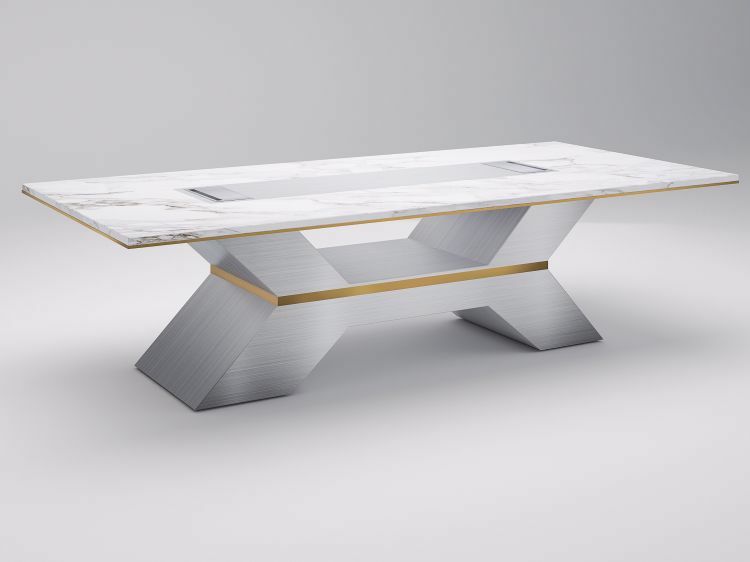 The top is shown in Calacatta marble with brushed aluminum inlay. There is so much we can talk about when it comes to making creative conference-table design selections. Our team of professionals can deliver the design service, sizing, materials, and colors to match your preferences.